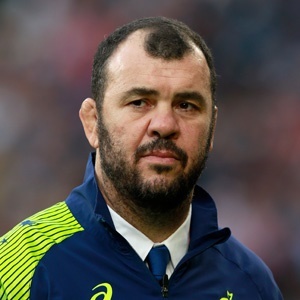 London - Australia coach Michael Cheika's conduct during his side's defeat by England at Twickenham is under investigation after he appeared to mouth an obscenity. The Wallabies coach was infuriated by a number of refereeing decisions and when a Michael Hooper try was disallowed in the first half, he appeared to mouth an expletive in reference to the decision made by referee Ben O'Keeffe. When asked during a broadcast interview if he had actually mouthed an expletive and called O'Keeffe a "cheat", Cheika ended the interview. On two occasions he walked down the steps from the coaches' box to the touchline to remonstrate with officials and received abuse from supporters that he described as a "gobful" that was "not pleasant", at one point resulting in a verbal exchange with a fan. Jon Davis, the disciplinary officer for the autumn internationals, is looking into his behaviour. "Following various media reports and a referral from World Rugby, the comments and conduct attributed to Michael Cheika are being investigated. An update will be issued tomorrow (Tuesday)," read a statement issued by the body that oversees disciplinary matters for the November Tests. Cheika called into question rugby union's replay procedure after several decisions went against his side. With England just 3-0 ahead, Australia were denied a 27th-minute try on review after Wallaby captain Hooper was ruled to have been in front of the kicker at Twickenham. To make matters worse for the Wallabies, the 54th-minute try that England's Elliot Daly scored to give the hosts a decisive 11-3 lead was awarded after numerous replays failed to determine if the kick by scrum-half Ben Youngs that the Wasps wing re-gathered had first gone into touch. There was a lengthy delay in each case as New Zealand referee O'Keeffe consulted with Irish TV match official Simon McDowell.